What Works: The Hunger Games — Is Its Violence Appropriate? I wasn’t going to write about The Hunger Games movie – I’m a huge fan of the books and had no advance screening, so I just went to the theater with everyone else on opening night as a consumer. But I have to share my reaction to concern expressed about The Hunger Games‘ violence which I’ve read in the days following the movie’s release. I was certainly very interested to see how they makers of the movie would deal with translating the book’s extreme brutality against and among children into a movie that children could watch. I am surprised they went as far as they did and think they came very close to the edge. There’s lots of blood, and a few of the children are killed onscreen — but the violence is never gratuitous. Much of the criticism is from people reacting without bothering to understand, but Bo Sanders’ interesting post in Homebrewed Christianity caught my eye. Essentially, Bo loved the movie, but expresses some concerns raised by the fact that when he saw the movie there was cheering when a “good” character killed a “bad” character. It’s a thoughtful post and the comment thread is heady and interesting. Perhaps if anyone had cheered at the violence when I saw it, I’d have had the same reaction — as I did last year when I wrote about my repulsion at the celebrations over Ben Laden’s death — but I find nothing to criticize in The Hunger Games‘ use of violence. The Hunger Games does not glorify violence or desensitize people to it. It is a story of loss of innocence, and the intrusion of violence is a key part of that loss. As a commentary on brutality by an empire against its subjects and the vicarious enjoyment of others’ suffering, it would not work without showing any brutality or suffering. Yesterday I watched a religious war movie that glorified violence. It held up violence done in the name of religion, honor and freedom as something praiseworthy; it nearly said that this killing was good. That is troubling. In The Hunger Games, on the other hand, we see some of the killers as disturbingly amoral, some as products of their conditioning, and in the few cases where violence is performed by one of the “good” people, it is sad and disturbing. 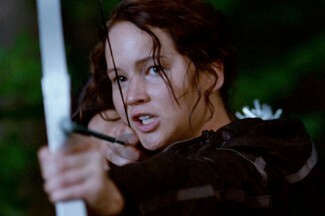 The Hunger Games does not glorify violence or desensitize people to it. It is a story of loss of innocence, and the intrusion of violence is a key part of that loss. As a commentary on brutality by an empire against its subjects and the vicarious enjoyment of others’ suffering, it would not work without showing any brutality or suffering. To the extent that the movie (inevitably) toned down the violence in the book, it made a weaker statement. The fact that some people may watch its portrayal of vicarious viewing of violence and vicariously enjoy it is sad but inevitable. It doesn’t mean the moviemakers missed the mark. I was troubled by one thing I saw at the theater when I viewed it on opening night: the under-10-year-olds brought by their parents. No matter how important the lesson, I think it’s wrong for prepubescent kids to see children getting killed. Especially with their parents’ endorsement. Even older kids and adults who are easily freaked out may be better of not going anywhere near it. I myself had the misfortune to be seated in front of a fiftysomething woman who kicked my seat any time anything tense or startling happened. I’d have been better off with kids behind me. I’ve written here before about avoiding the fear-mongering of TV news, and shows like 24 which do the same thing with fiction, uselessly filling our heads with things to make us anxious. But that is not to say that we should live in a puffy-clouded world of denial. Jesus said, “Blessed are those who mourn.” We should be upset when we see killing. And exposing oneself to thoughtful portrayals of the wrongs in the world can be an enriching and empowering thing, even if disturbing. I believe The Hunger Games is thoughtful and empowering. What do you think? On the oft-criticized camera work, I defer to a friend in the industry, Tim Hickson, who nailed it with, “JJ Abrahms called and told me he wants his genre back.” I realize super-tight close-ups and shaky-cam are supposed to add excitement, but it was over the top. Finally, the music was phenomenal. I’m so thrilled that instead of loading the movie full of predictable indie pop-rock, they did an amazing thing and brought in T-Bone Burnett to give The Hunger Games music appropriate to its Appalachian setting. It’s a dark, mournful alt-bluegrass delight of original songs written and performed by fans of the books — the Civil Wars, Taylor Swift, Arcade Fire and The Carolina Chocolate Drops stand out. I’ve been listening to nothing but the soundtrack for the past week and am nowhere near tired of it yet.